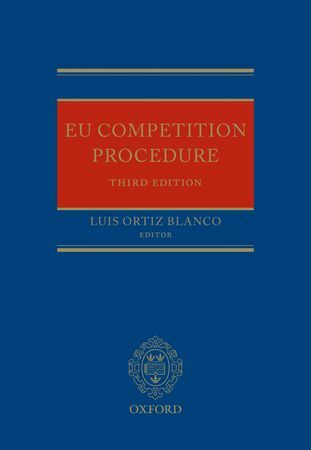 The 3rd edition of EU Competition Procedure (Oxford University Press) is out. I’m the least objective reviewer, because its editor is Luis Ortiz Blanco, who, among many other things, is the person because of whom I work in competition law (he essentialy planned my whole professional career the very first day he interviewed me for an internship, when I was only 20). For this third edition Luis has brought together a truly exceptional team. In addition to my colleagues Konstantin Jorgens, Marcos Araujo and José Luis Buendía, who, together with Kieron Beal, Gordon Blanke and Jean Paul Keppenehad already contributed to the 2nd edition, there have been very notable additions from the Commission’s Legal Service and DG Comp, namely: Carlos Urraca, Ralf Sauer, Corneliu Hodlmeyr, Manuel Kellerbauer, Nicolas von Lingen and Maria Luisa Tierno Centella. The book (a short read of over 1,200 pages) deals in more depth than any other source with procedural issues in antitrust, merger control, State aid, public undertakings and exclusive/special rights, competition enforcement in the EEA and arbitration. It’s a must-have. I’ll do my best to get you an invite for the launching party, like last time. Congrats to Luis and all the team. A “must read”. Just ordered at GA&P. I look forward to receiving my copy!